STORRS, Conn. - Despite a valiant effort, the UConn women's hockey team dropped an overtime heartbreaker to No. 3 Northeastern, 2-1, Friday night at Freitas Ice Forum. UConn held a 1-nil lead after the first period after junior Catherine Crawley stole the puck and converted on a shot from the faceoff circle. The home Huskies maintained the one-goal lead after two periods, as junior netminder Morgan Fisher turned back seven shots. Over the next 23 and a half minutes, the Northeastern offense ramped up its attack and locked in on defense, outshooting UConn 18-2 over the last two periods. The visitors tied the game with a late third period goal, then stole away the victory with a golden goal in overtime. UConn struck for the game's first goal with just under 17 minutes elapsed from the first period. Catherine Crawley stole the puck, weaved her way through three Northeastern defenders and after stumbling a bit, regained her balance and fired a shot near the right faceoff circle that nestled into the bottom left corner of the net to give the home team a 1-0 lead at 16:40. The Northeastern offense came out aggressive and applied pressure to Morgan Fisher in the second period, peppering the UConn goaltender with seven shots but were unable to capitalize on the opportunities as Fisher stuffed the seven attempts. Northeastern's Aerin Frankell was equally up to the task, turning away all four shots she saw from the home team. The visitors amped up their attack in the third period, outshooting UConn 14-2 over the course of the 20 minutes. Despite a strong effort from the UConn defense, Northeastern found the equalizer late in the period to tie the game. Chloe Aurard ripped a missile from the right circle at 18:24 to level the score at 1-1. 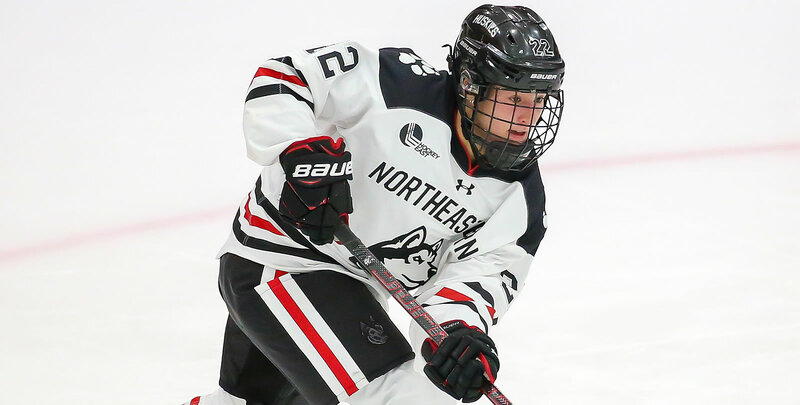 Northeastern completed its comeback in overtime, as two teammates set up Skylar Fontaine for the game winner at 3:31 to give the road team a 2-1 victory.